Go for the flavour of flat-leaf as you heap into this Middle Eastern-style tabbouleh salad, great as a sandwich filler or as an accompaniment to a hearty soup. First, prepare the bulgur by placing it into a large bowl with a teaspoon of salt. Pour the 3½ cups of boiling water over the top and cover firmly with a lid so that all the liquid can be absorbed, around 10 minutes. Lightly fluff with a fork and set aside to cool. Blanch the beans and broccolini separately in a pot of boiling water for a minute or until al dente. Refresh under cold running water and drain. 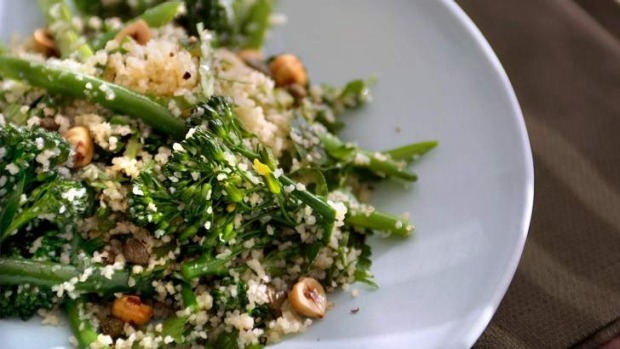 Slice each bean finely, then toss together with the broccolini into the bulgur, adding parsley, capers and chopped hazelnuts. Make the dressing by whisking together the oil, vinegar, garlic, black pepper and a ¼ teaspoon of salt. Pour over the salad, toss it and allow it to stand for 15 minutes before serving. Eat at room temperature.